Escape the city with this stylish kiwi cottage. The house has 2 double bedrooms and a 3rd double bedroom in a sleep out adjoining the main house. A modern kitchen gives the option to cook. This sun drenched house has decks on both sides, private north facing outdoor living at the back with the front deck flowing from the lounge with relaxing sea views. Small pets are ok, but subject to approval. Please enquire if you'd like to bring your furry friend! The house is close to everything, 100m from a bus stop so easy to get to and from the ferry and walking distance to shops, cafes, and beaches. If you're coming for a wedding it's 5-10 minutes in a taxi to nearly all the vineyards on the island. 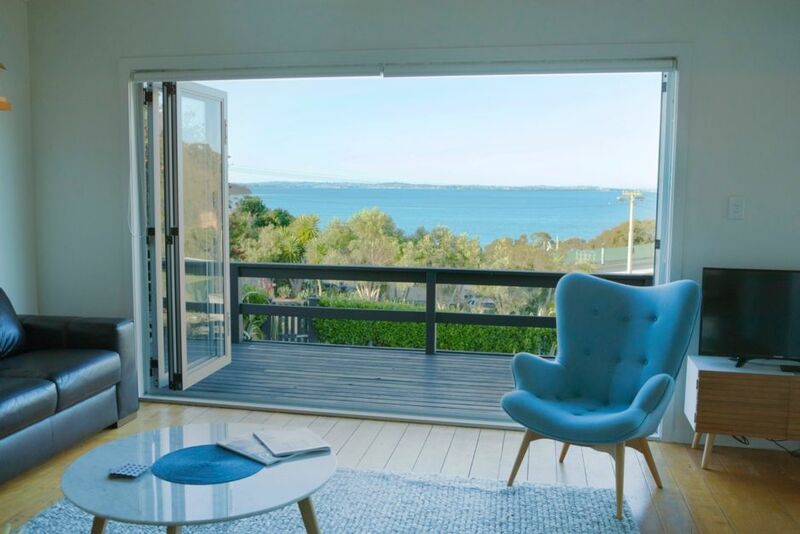 Surfdale is perfectly placed to enjoy everything Waiheke has to offer. Surfdale Beach is less than 3 minutes walk from the house and offers safe swimming and boating when the tide is in. A short walk will take you to French Hot, a French patisserie, cafe and restaurant serving amazing food and coffee. In the same block you will find a clothing, art and interiors designer boutique, a general store (dairy) takeaway food, bakery and fruit and vegetable store. There is also an Irish Pub and a family friendly Italian Pizzeria a short walk away. The house is extremely easy to get to by bus or by car. If coming by the Ferry from downtown Auckland the bus from the wharf will take you to a bus stop 100 metres from the house. Easy! Note: The 3rd bedroom is a lovely sleep out separate from but right next door to the house. It is only a few meters from the back door or the main house, safe and secure. The single bedroom is in the main house and is a lovely but small doorless room. Beautiful view and location, well equiped , clean and very comfortable. Lovely property with gorgeous views, 6 of us very comfortably, really enjoyed our stay. Just wondering about a washing machine. Great place to stay,very clean the extra touches of cereals tea coffee an condiments was awsome. Thanks Kurt for providing us with a great place to stay while we visited beautiful Waiheke.We are already planing our next trip. We really enjoyed staying here. Lovely little place with everything we needed. Great sea view and general design of the place. We’ll definitely go back! Great place to stay with an awesome view. All the little details have been thought about. Excellent place for dogs and a lovely weekend away. "Not for the Disabled", two flights of steps. Coffee, Pan Cake Mix etc, Was roomy enough for 7 of us, Bowling Club across the road.